We have recently gotten several questions from customers regarding an ESN (electronic serial #) or a MEID# (mobile electronic Identifier). If you are unable to locate your serial number but do find the MEID number it is because the cell phone companies are changing the way they provide this number. We will accept the MEID number. The Wireless industry is exhausting its supply of Electronic Serial Numbers (ESNs) and a new type of identifier – Mobile Equipment Identifier (MEID) will be used in new wireless phone equipment in place of the ESN. Is there a difference between ESN and MEID? ESN and MEID will function in the same way. 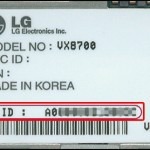 Currently, an ESN (Electronic Serial Number) is assigned to each customer handset. Since the current supply of ESNs is being exhausted, a new type of handset identifier (MEID) was needed. MEID handsets will act no differently than ESN handsets and will work in the exact same way. Why is this ESN / MEID change occurring? The current supply of ESNs (Electronic Serial Numbers) within the Wireless Industry is being exhausted. The Telecommunications Industry Association (TIA) proposed this change.